If you want to use Tor for anonymous web browsing, please use Tor Browser. It comes with readily configured Tor and a browser patched for better anonymity. To use SOCKS-Proxy directly (for RetroShare, instant messaging, Jabber, IRC, etc), you can point your application directly at Tor (localhost port 9050, or port 9150 for Tor Browser), but see this FAQ entry for why this may be dangerous. 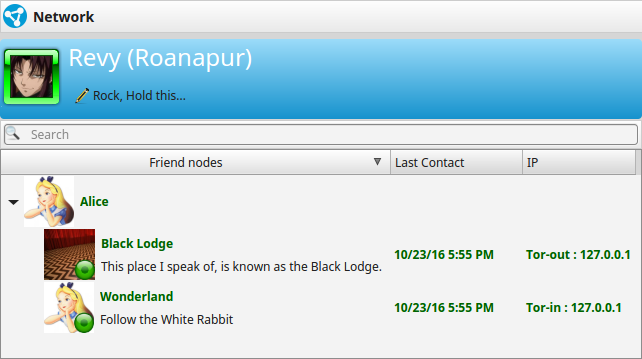 RetroShare can be run behind a Tor Hidden Service for incoming connections. The outgoing connections are sent through a local Tor-Socks-Proxy. This makes it possible to obfuscate your metadata which could disclose your Network Friend Graph. The hidden service address (e.g. ld546kr3zr462z3p.onion) is replacing the IPv4 address (e.g. 192.168.1.216) as the listening address for incoming connections. Tor allows clients and relays to offer hidden services. That is, you can offer a web server, SSH server, etc., without revealing your IP address to its users. In fact, because you don't use any public address, you can run a hidden service from behind your firewall. This Guide requires to have Tor already installed on your System. If not, please refer to the offical Tor Documentation on how to install Tor. By default Tor will create a SOCKS Proxy on localhost for outgoing connections. The HiddenServicePort directive contains the port where the Hidden Service should listen and the local IP and the local Port where RetroShare is listening. Add a section for your hidden service. The HiddenServiceDir directive tells Tor where to look for the Hidden Service Directory containing the private key of the Hidden Service. Each Hidden Service Owns it's own directory. The directory needs to be created and having permissions of the Tor User. The HiddenServicePort directive tells tor on which port to listen, to forward to which ip and to which port. Go to /var/lib/tor/ and create a directory for your new Hidden Service. Change the owner of the directory to the user running tor. drwx--S---  5 debian-tor debian-tor 4.0K Oct 23 12:26 .
drwxr-xr-x 74 root       root       4.0K Apr 29 20:23 .. Restart your Tor Daemon. Tor will create a crypto key for your Hidden Service in the HiddenServiceDirectory. The Hostname of your new Hidden Service will be available in the file hostname just created in your Hidden Service Directory. For more details please also read Create New User for clearnet IPv4 Network Node. Check your Network Config. It should look different to a normal setting. Discovery is recommended, though also Darknet(Discovery & DHT are disabled) may be used. Tor Socks Proxy Your Tor Socks Proxy is normally available at localhost and port 9050. The Indicator shows if the proxy is working. 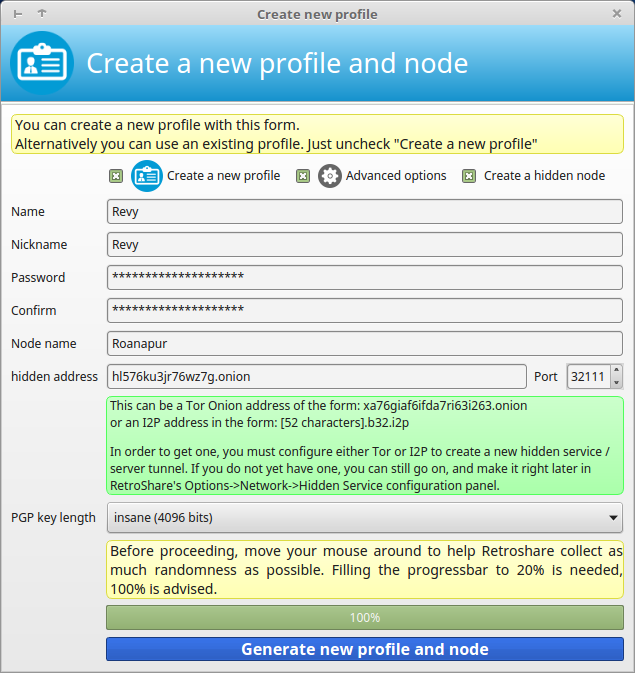 I2P also creates a SOCKS Proxy, which can be used to connect to I2P Hidden RetroShare Nodes. Here you need to enter the Hostname which has been created by the Tor HiddenServiceDir. For an easier usage, both ports should be used symmetrically. Normal Nodes may also use Tor Socks Proxy for outgoing connections to Hidden Services. Outgoing connections are always routed through the local Tor Socks Proxy to .onion addresses. All Traffic is routed inside the Tor Network. Hidden Nodes cannot connect to IPv4/Normal Nodes, because Tor-Exit nodes are not used. 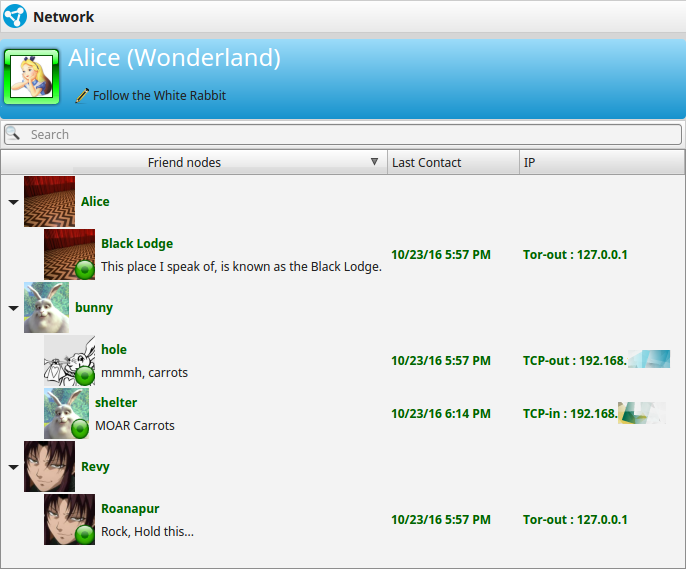 Though the other way Normal Nodes can reach Hidden Nodes through Tor Socks Proxy. Tor connections incoming and outgoing from and to Hidden Nodes.